An AC series circuit consists of a resistor with resistance of 90 Ω, a coil with inductance of 1.3 H and a capacitor with capacitance of 10 μF. The circuit is connected to an AC voltage source with amplitude of 100 V and frequency of 50 Hz. Write an equation for instantaneous values of voltage and current in the circuit, if the initial phase of the current is zero. The behaviour of alternating voltage and current can be described by a sine function. Find the equations describing the instantaneous values of the alternating voltage and the current. When evaluating these equations we need to know the current amplitude Im and a phase difference φ0u between the voltage and the current. These we determine by using Ohm's law for alternating current. 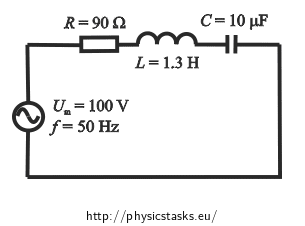 In the task Series RLC Circuit you can find a detailed explanation of the calculation of the current and the phase difference. We use the formula for phase difference expressed by impedance of each element. The phase difference of the current is zero; the current amplitude Im has been calculated above. We know the voltage amplitude Um and we have determined the phase difference. The time values inserted into the equations are converted into seconds.